Energy storage is the key to renewables. A decade ago, solar panels could make electricity during the day, which was great. But in most parts of the world, the highest demand for electricity occurs in the late afternoon and early evening — times when solar panels produce little electricity. Wind turbines are wonders of modern engineering but of little use if there is no wind to turn their blades. Being able to store electricity now for use later is what makes renewable energy capable of providing reliable baseload power at all times of day or night. How long that storage ability lasts is one of the primary ways that energy storage systems are classified. Cost, of course, is another. It is one thing to store electricity for a few hours; quite another to store it for days or weeks at a time. The ultimate goal of energy storage is systems that can store energy for entire seasons, so Londoners can heat their homes in the winter with electricity stored in the summer. Batteries today cost around $280 to $350 per kilowatt hour and are just at the threshold of being able to store electricity for several hours or perhaps an entire day. The costs are coming down, with some industry experts predicting prices will fall below $100 per kWh in the future, but that price is still years away. Batteries also have a useful life — typically 20 years. After that, they need to be replaced. Swiss startup Energy Vault has a different idea. According to Quartz, it plans to construct energy storage systems that use concrete blocks. 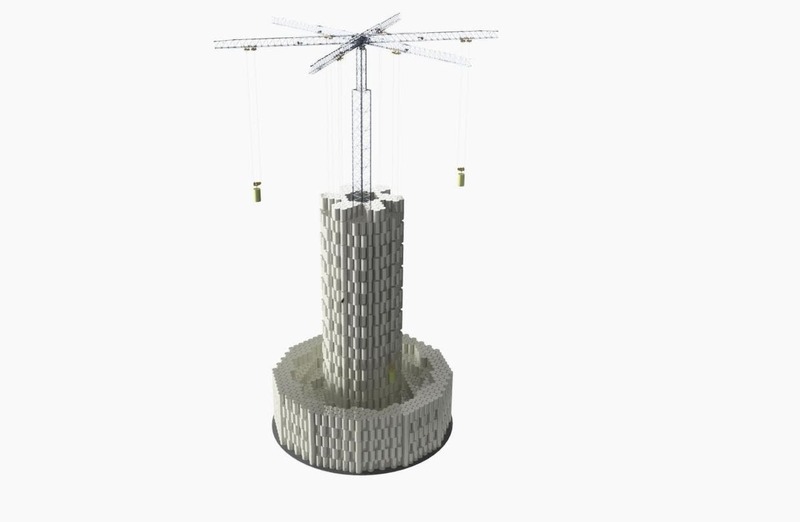 A 400′ tall crane with 6 arms uses excess electricity to power electric motors that lift and stack concrete cylinders weighing 35 metric tons each all around it. Later, the crane lowers them back to the ground, generating electricity during the descent. Think of it as a regenerative braking system that operates vertically rather than horizontally. The current cost of an Energy Vault system is around $150 per kWh. The entire system can store 20 MWh of electricity. Batteries can store that same amount of electricity in a smaller space but have a useful life of about 20 years. There is little long term data available about how utility scale batteries might degrade over time, but extrapolating from electric car experience suggests a fall-off in capacity of between 10% and 20% after 20 years. Energy Vault claims its system has an overall efficiency of 85% versus 90% for a typical battery storage installation and has a useful life of at least 30 years with little to no degradation in performance over time. The company uses off the shelf components that have been manufactured by ABB and Siemens for decades, so equipment costs are kept to a minimum. Oddly enough, the biggest expense is for the concrete. Here the company has thought way outside the box — or the concrete block — and devised a way to make concrete for one sixth the usual cost. They mix cement with materials cities often pay to get rid of, like gravel or building waste. Energy Vault CEO Robert Piconi has been busy touting the system to customers in Africa and Asia. He says the company has orders from US customers for energy storage systems that will be built in early 2019, but was unwilling to share specifics about who those customers might be with Quartz. In the world today, pumped hydro can claim to be the most frequently used energy storage technology. Quartz says it accounts for 90% of all energy storage. It is almost as simple as raising and lowering blocks of concrete. Pump water uphill when excess electricity is available, then use it to spin generators when it flows back downhill later. But pumped hydro takes up enormous amounts of land and requires one critical component — mountains or at least hills with one large reservoir at the top and another at the bottom. The latest pumped hydro plan in the UK will be located in the highlands surrounding Loch Ness in Scotland. A company called Advance Rail Energy Storage is proposing something similar to the Energy Vault concept — a train in the Nevada desert that crawls its way uphill, then generates electricity when it rolls back down to the bottom. It is simplicity itself, but since the company has no news to report on its website after 2017, the plan seems to have found few backers. Are a collection of concrete cylinders the answer to the world’s energy storage needs? No, but they could be one technique among many to help move the clean energy revolution forward. Having many tools to choose from when designing a world that runs on renewable energy is a good thing. Watch the video below for a look at a small-scale proof of concept system constructed presently undergoing testing in Switzerland.